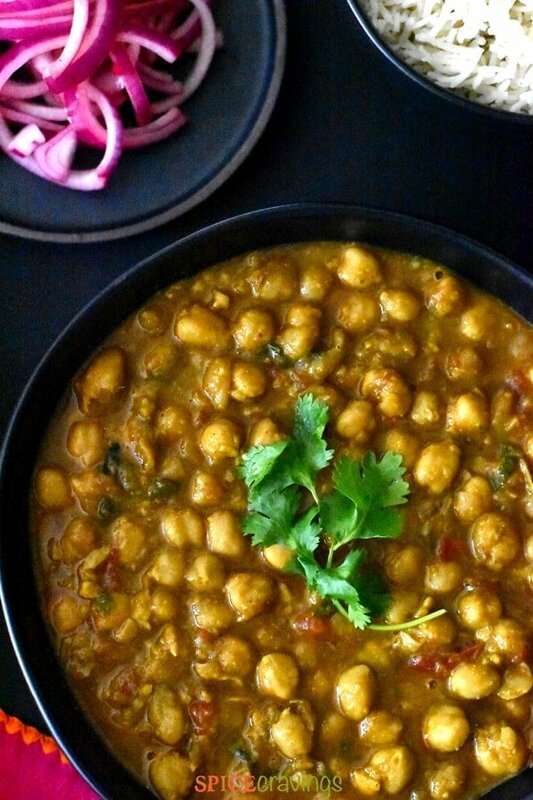 This is a simple recipe for a popular Indian spiced chickpea curry called Chana Masala. This hearty and delicious curry is made with chickpeas or garbanzo beans, which are rich in iron, protein and are naturally vegan & gluten-free. Enjoy it over aromatic basmati rice, or pair with Naan. How to Cook Chickpeas or Garbanzo Beans? When I can plan ahead, I prefer to cook dried chickpeas or garbanzo beans. They turn out creamier than the canned chickpeas. I soak them overnight, rinse them and pressure cook with the seasoning for 35 minutes, in my electric pressure cooker, Instant Pot. The same process can be followed in any other pressure cooker too. If you want to cook them separately and add the seasoning later, you can follow this easy recipe to cook chickpeas in 15 minutes. 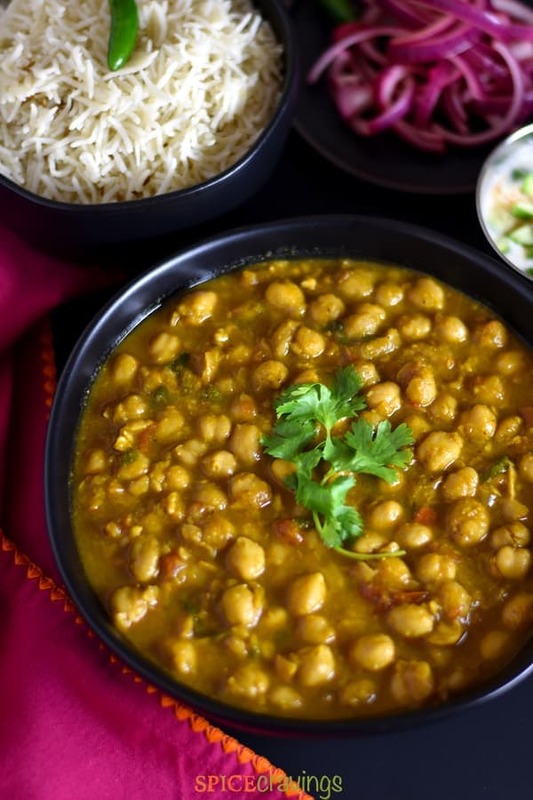 , you can reduce the total cooking time to less than half for this channa masala recipe. I simply rinse out the canned chickpeas and add them to the pot as per instructions, and pressure cook everything for 5-6 minutes. Once the cooking is done, I wait 10 minutes before releasing the pressure manually. Cooking legumes and beans is a breeze in Instant Pot, or any electric pressure cooker. 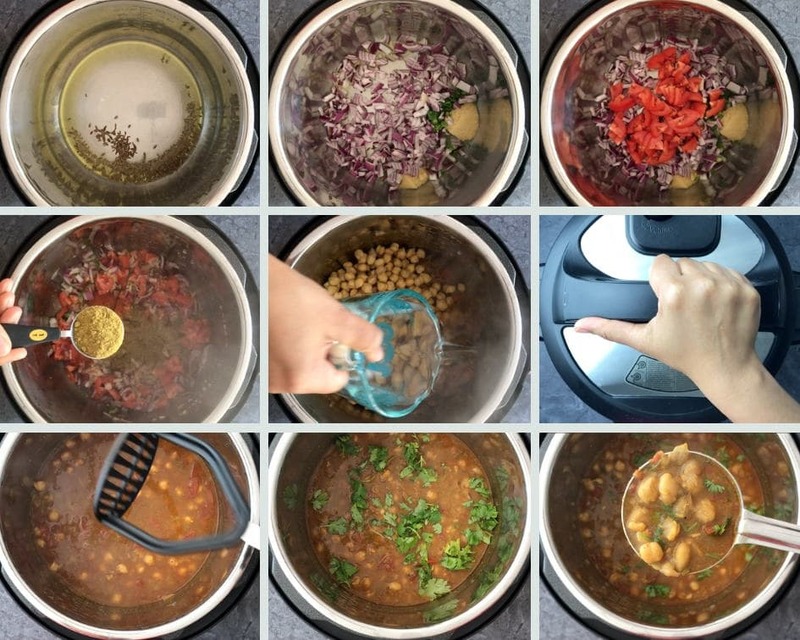 It’s an easy method, that is mostly hands-off, which means the chickpea curry practically cooks itself. 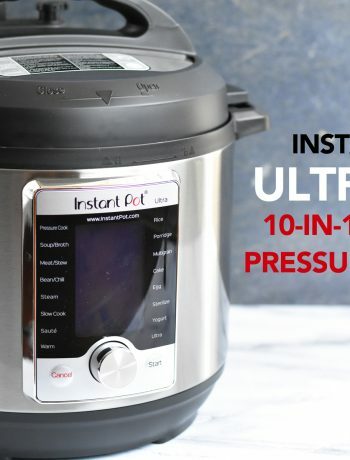 Pressure cooking method reduces the cook time considerably, which is always a big plus. If I were to cook them in a pan over the stove, I would end up cooking them for around 50 mins-1 hour, to get a similar consistency. Plus, I would have to stir the pan every now and then. ✓ I soak dried chickpeas in water overnight, or, for about 8-10 hours. ✓ Heat oil on saute mode (high). ✓ Next, add onions, crushed ginger and garlic, tomatoes and saute for 1 minute. ✓ The garam masala and other spices go in next. If you don’t have all the spices listed below, you can find ready-made chana masala powder in many stores. ✓ Add the strained chickpeas and water. Close the lid and pressure cook for 35 mins. ✓ Let pressure release naturally and open lid after the pin drops. ✓ Using a potato masher, mash a few beans. This makes the Chana Masala creamier. ✓ Squeeze fresh lemon juice, about a teaspoon. Stir in roasted cumin powder and chopped cilantro. 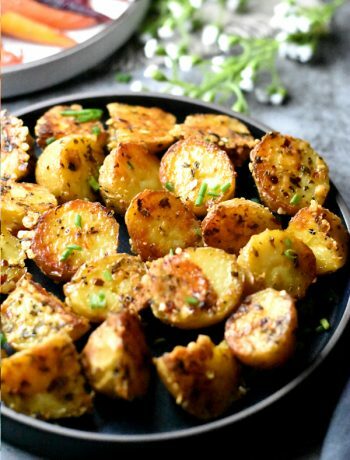 Serve warm with naan or Jeera rice. 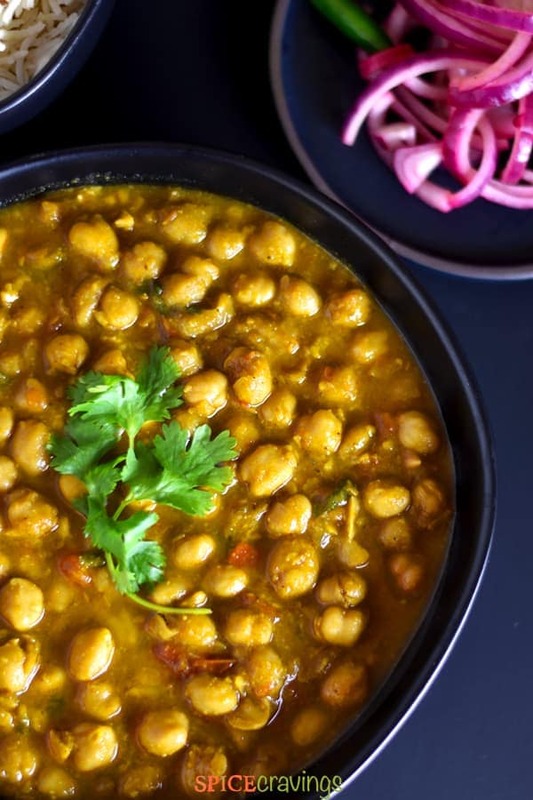 What is the Difference Between Punjabi Chole and Chana Masala? These days, I often find, that Indian food restaurants use both these names interchangeably, but in my opinion, there is a difference in taste and spices used for these two dishes. Of course, like any classic recipe, there are a zillion variations of this dish. 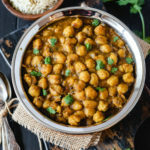 Punjabi Chole/ Punjabi Chana Masala/ Chole / Chole Masala is referred to a popular street-food style preparation of Indian chickpea curry. 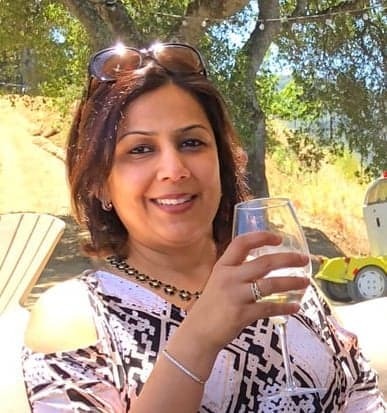 It is more spicy and tangy than Chana Masala. You can find some of the most authentic Punjabi Chole preparations in and around Punjab and New Delhi. It’s distinguishing factor is a dark-brown curry or gravy, and a slight tangy flavor, both of which are a result of cooking Chole (chickpeas) with a combination of dry-mango powder (amchur) and dry pomegranate seeds powder (anardana powder). I also add a tea-bag while cooking Chole, to enhance that dark color. I don’t add any turmeric to Punjabi Chole, and add very little tomato. Click here for PUNJABI CHOLE RECIPE. Authentic Chana Masala or chickpea masala on the other hand, is a tomato-onion rich gravy, with an iconic reddish-orange curry sauce. I get that color by adding turmeric, Kashmiri red-chili powder (similar to paprika), and tomato puree, as detailed in the chana masala recipe card below. The tomatoes form a foundation for this curry and give it a slightly sweet taste. That contrasts perfectly with the earthy spices. That being said, both these chickpea curries are awesome, so no matter which one you make, you can’t go wrong! A simple recipe for a popular Indian spiced chickpeas curry called Chana Masala. This hearty and delicious curry is made with dry or canned chickpeas, which are rich in protein and are naturally vegan & gluten free. Enjoy it over aromatic basmati rice, or pair with Naan. Rinse and soak dried chickpeas or garbanzo beans in about 4 cups of water, overnight, or at least 8-10 hours. Strain and rinse them once again before cooking. Alternatively, use canned chickpeas/garbanzo beans. Rinse well and strain them. Heat oil (or ghee) on SAUTE (high) in the instant pot, about 30 seconds, add cumin seeds. When cumin begins to splutter, add onions, ginger, garlic, green chillies, tomato and saute for a minute. Add spices, chickpeas and water. Close the lid, vent set to 'sealing', and pressure cook for 35 minutes at Bean or Manual mode. The time variation depends on how soft you like your chickpeas to be. If you're using canned chickpeas, reduce the cooking time to 5-6 minutes. Wait for the pressure to release naturally for 10 minutes. Carefully release the remaining pressure and open the lid after the pin drops. Using a potato masher or a wooden spoon, mash a few beans. This makes the curry creamy and thick. Garnish with cilantro and roasted cumin powder. Squeeze in some fresh lemon juice. 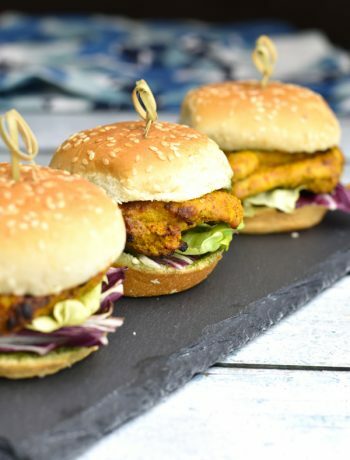 Serve with Puri, Naan, or Jeera Basmati rice!